Those who were too young to remember or those who were born after the EDSA People Power in 1986 were told how the nation suffered due to Marcos' excessive lifestyle. They were informed of the efforts to recover the loot and the continuous struggle to give justice to the victims of Martial Law. They were called to make sure history does not repeat itself, and to contribute to the achievement of good governance in the Philippines. 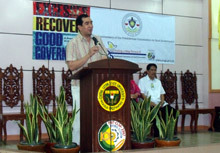 Following the successful exhibition entitled Excesses, Recoveries and Good Government of the Presidential Commission on Good Government (PCGG) in January 2011 in Makati City, PCGG is bringing the exhibit to major universities in the country. 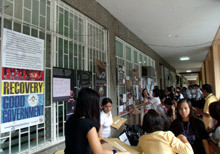 The "Journeying Exhibit" has been showcased in Central Luzon State University (CLSU) on July 11-15, 2011 and in Ateneo de Naga University (ADNU) on July 18-22, 2011. 15 more schools are scheduled to host the exhibit that runs until December 2011, which is part of PCGG’s 25th Anniversary celebration. PCGG forged partnerships with universities identified by the Commission on Higher Education (CHED) as “centers for excellence” in teacher education and in agriculture for the exhibit. “Teacher education because the Commission firmly believes that the historic aspect of the Marcos plunder and the values associated with good governance are matters which educators must be aware of as they have charge of the post-EDSA generation’s edification. Agriculture because not only is the coconut levy one of the most contentious issues of plunder, but monies recovered by the Commission, by law, necessarily goes to the agrarian reform program,” explained PCGG Commissioner Maita Chan-Gonzaga. The exhibit is launched with a forum on the work of PCGG and on governance. At CLSU and ADNU, PCGG Chair Andres Bautista discussed the issues about the Coco Levy Fund and the Commission’s lobbying for the passage of the Human Rights Compensation Bill. The Commissioners engage teachers and students in the fight against corruption and take on the responsibility of establishing good government in the country. As many as 300 people participated in the forum, and 700 individuals viewed the exhibit. “We support PCGG’s initiative to involve the youth in the campaign for good government. They may be the post-EDSA generation, but they can be the current catalysts of change and the future’s great leaders,” said Jules Maaten, Country Director of the Friedrich Naumann Foundation for Liberty (FNF) Philippines who is sponsoring the PCGG Journeying Exhibit.